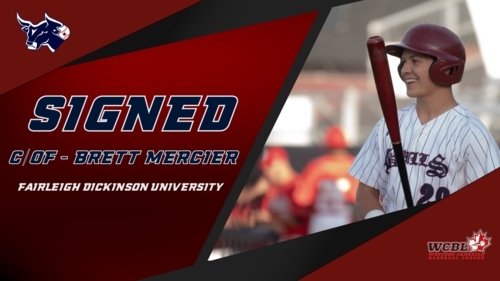 LETHBRIDGE, AB - The Lethbridge Bulls have announced the signing of returning player, C/OF Brett Mercier out of Fairleigh Dickinson University (NCAA Divison I). 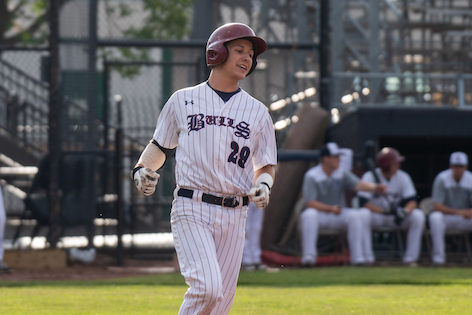 Mercier appeared in 21 games last season for the Bulls and became one of their most consistent hitters on the year as he posted a batting average of .368, before an injury ended his season in late June. "I'm excited to return to the Bulls because of the young core of players we have both coming and returning. It's very exciting as I feel we have a great chance to be successful come the 2019 season. I also really appreciate the staff the Bulls have as well. We are fortunate enough to have great coaches and ownership that treats us like pros," said Mercier. "My favourite thing about playing for the Bulls is the diversity of the team. All the boys come from all over North America and from all different schools. It's fun to hear about their journey and success that baseball has brought to them," Mercier added. The former Vauxhall Academy of Baseball product currently plays college baseball in Teaneck, New Jersey for the Fairleigh Dickinson Knights. Before his time with the Knights, Mercier spent two years at Indian River State College in Fort Pierce, Florida. The Moncton, New Brunswick native will be looked upon to be a middle of the order bat, providing heavy offence and great defensive ability for the Bulls this upcoming season. "I feel I can bring a reliable bat to our line-up, while defending my position this season. I like to think I bring some leadership and energy to the field, but that's for the boys to say." The Bulls season begins May 25th in Edmonton, as they take on the Prospects in a two game set before heading home to face the Fort McMurray Giants in the VisitLethbridge.com Home Opener May 30th. Season tickets are now available and can be purchased by clicking here. Keep up to date with Lethbridge Bulls player signings by checking out BullsBaseball.com every week, or by following us on social media.